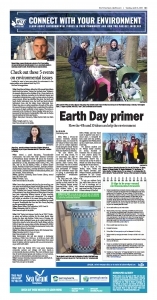 The Erie Time New Newspaper in Education (NIE) program educates teachers, students, and members of the Erie community on important coastal environmental issues such as non-point source pollution, climate change, marine debris, invasive species, and emerging contaminants. Pages are developed every Tuesday during the school year from September through June and include a lesson plan on the topic highlighted each week. Check back weekly for the latest issue!